Last fall I was in San Francisco for a short visit. San Francisco is a place which will always be in my heart, since I lived there for a while. It is such a great place, with wonderful people and awesome food. I try to go there as often as I can, so I was very happy when we managed to stay a week in San Francisco on the way to our honeymoon in Hawaii. One of the places I always wanted to visit in San Francisco is the Ferry building, since I have never been to its indoor market. It is not as big as the Pike Place Market in Seattle or Granville Island in Vancouver, but it has some great shops and a very good selection. The prices are pretty steep, but it is also at a premium location. The place I was most curious about was the famous pastry shop Miette. It is renowned for his charming interior design and beautiful pastries. I really loved that store, the wallpaper, the cake stands the set-up; it's just totally cute. We were having some cupcakes, and they were equally delicious. If I would open a pastry store I would want it to look like this one. So, as soon as I got home I got the Miette cookbook. It fits perfectly to the shop design in color and layout. There are many recipes I would like to try, but after all the Christmas baking it took me until now to make something out of the book. The first thing I made is the carrot cake plus some carrot cupcakes. 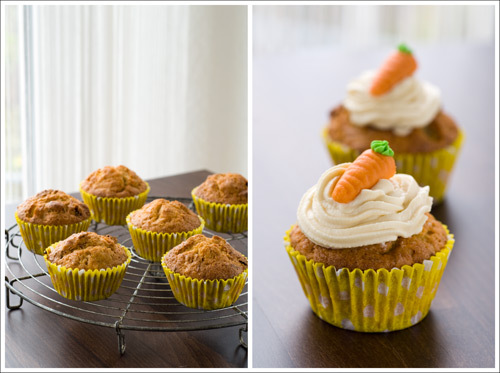 I have some carrot cupcakes posted before, but these ones were even better. I really liked the addition of coconut. Since I only had my small muffin tin available I also made a small mini cake. Line a 15 cm (6-inch) springform pan with parchment paper. For the cupcakes line a 6-cup muffin pan with paper liners. Preheat the oven to 180° C (350° F). Sift together the flour, baking powder, cinnamon and salt into a bowl. In another bowl whisk together the eggs and the sugar using a handheld mixer on medium speed until creamy. Slowly add the oil while mixing on low speed. Then whisk for another minute on high speed. Add the flour mixture spoon by spoon and mix until smooth. Now fold in the carrots, raisins, walnuts and coconut using a spatula. Divide the batter between the springform and the muffin pan, making sure to fill the muffin cups only twp-thirds full. Bake for about 20-25 minutes for the cupcakes and 25-30 minutes for the cake. Take out of the oven and let cool on a wire rack. To make the frosting cream together the butter and brown sugar with a handheld mixer for 2-3 minutes until the sugar dissolves. Whisk in the cream cheese and corn starch for another minute until everything is smooth. Let the frosting cool for about 10 minutes before you use it. For the cupcake decorations fill the frosting into a pastry bag with a medium star tip. Hold the bag over your cupcake at a 90-degree angle and start piping from the edge in a spiral towards the center. Then end with a point. Decorate with marzipan carrots if desired. For the cake spread the frosting on top of it with an offset spatula until you have a smooth surface. 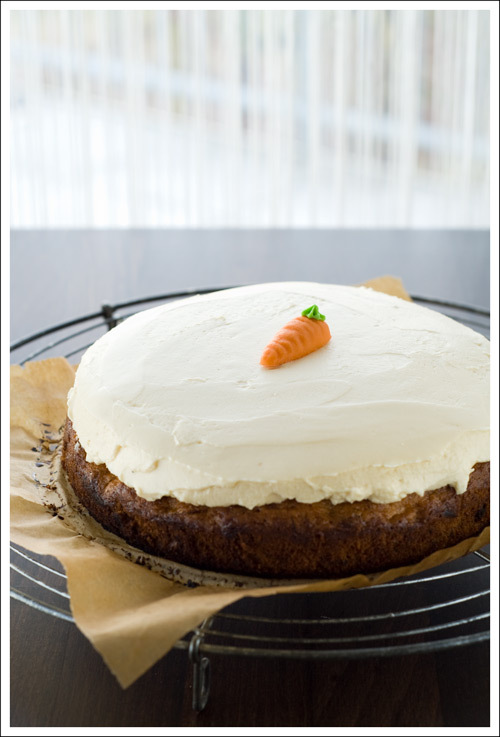 Decorate with a marzipan carrot in the middle.